Theme Tournament I: "The Men Who Stare At Goats"
Thats right, this first theme tournament. You can post saying that you are in on the thread, but I'm starting this tournament at at times listed below, so don't expect to get be in the tournament. Make sure you remind me everyday to host this, I tend to forget. However if you are caught participating twice, I will cut you. Out of the tournament. These will be 2/3 matches. All Decks must follow the April 2005 Banlist Also I personally recomend building your deck in YGO pro or Dev Pro so that you can you can make sure you aren't using cards from future formats. Remember whoever goes first gets the first draw. I'm in. Can you put the times in UTC as well. In case you are lazy when it comes to reading that, here I copied and pasted a lot of it for you. 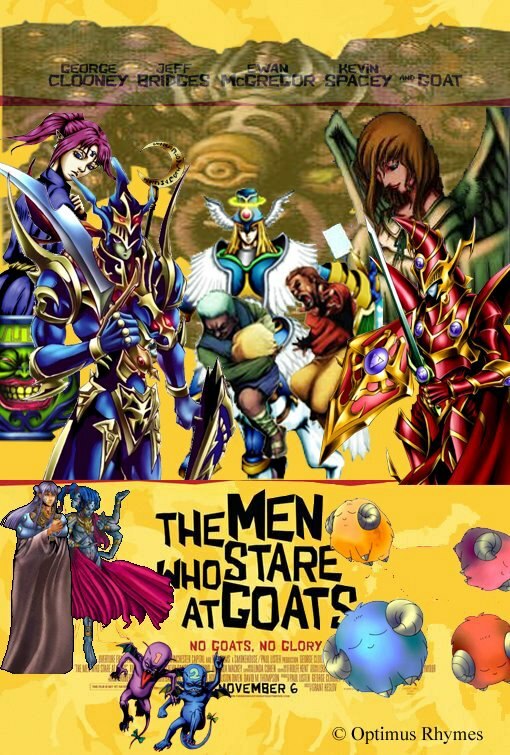 Also we're changing the name of the theme tournament to "The Men Who Stare At Goats"
* These cards had not been printed in the TCG for the duration of the April 2005 format. Magic Ruler was later reprinted as Spell Ruler, with the new set ID of SRL. This coincided with the Magician's Force change of "Magic Card" to "Spell Card", purportedly due to the possibility of a suit brought by Wizards of the Coast. Many other compilations of legal sets for this format include Dark Revelation Volume 2 and 3. While it is true that all cards reprinted in DR2 and DR3 were legal during Goat Control, DR2 was not printed until October 2005 and DR3 was not printed until November 2006. Hobby League 2 was not printed until 2006. During Goat Format the TCG did not have Ultra Parallel Rares; note that Hobby League 1 consisted of only Super Rares and Commons. If playing in person neither player should be using Ultra Parallel Rare versions of Main Deck cards because their increased weight substantially affects your draws. Rarity stacking did not exist in 2005 in the way it does now. It is interesting to note that a large portion of Main Deck cards that were staples or considered tech during Goat Format had Hobby League Ultra Parallel Rare reprints. There are two cards that took the first slot for The Dawn of Destiny. The North American release was DOD-001 The Winged Dragon of Ra, i.e. the unplayable God Card. The European release was DOD-EN001 Mesmeric Control. The latter was legal for Goat Control format, even in North America. JMP-EN004 was the English print of the unplayable Obelisk the Tormentor. JMP-EN005 Blue-Eyes Ultimate Dragon was not released until November 2005, in the January 2006 issue of Shonen Jump Magazine No. 37 Volume 4 Issue 01. Shonen Jump issues were regularly shipped two months before the issue date printed on the volume itself. SP1-EN003 Embodiment of Apophis was released as Cybernetic Revolution's Sneak Preview Participation card and thus not considered by the supermajority of players to be legal for Goat Format. 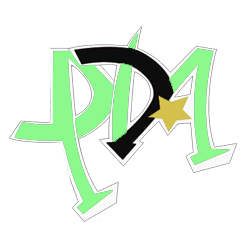 Many lists of legal cards for this format that you'll find online include the WCS Prize Cards from Worlds 2003, as well as Firewing Pegasus from Worlds 2005. While it's actually quite pointless to discuss because they were not widely available (save for reprints and the Toys'R'Us prizes) and Kanan, Black Luster Soldier (the Ritual) and Firewing Pegasus are terrible cards, it's interesting to note that those three cards were all Asian-English Editions, as were WCS-002 Victory Dragon and WCS-AE403 Sengenjin. Asian-English cards were never TCG legal even under UDE, and are only legal in the OCG if the player properly sleeves their entire deck, as the Yu-Gi-Oh! logo in the lower right corner of the cardback is not the same as other OCG prints. Because its not NEWGIOH? Its 2005 goat control with the cards that were out during the time. The 1:15am never got hosted mostly because lack of people. And I'm going to sleep now so I won't be hosting that, however the 5pm will be a thing, hope you nerds join! Subject: Re: Theme Tournament I: "The Men Who Stare At Goats"